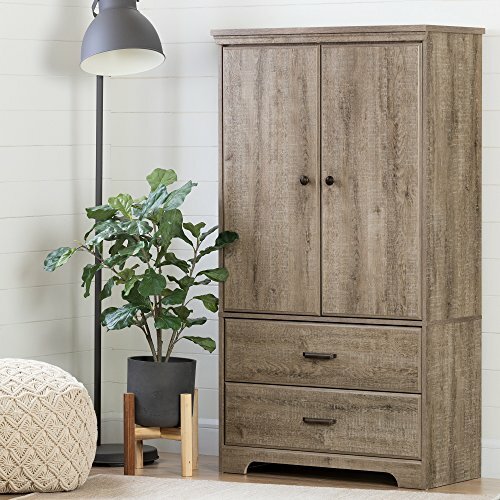 Stay organized, save space, and have plenty of working room with this computer armoire from the Harvest Mill collection. Behind its frame-paneled doors is hidden storage and space for your computer monitor, printer, CPU tower, speakers, and more. This computer cabinet features a slide-out keyboard/mouse shelf and printer shelf, a dedicated storage area for a vertical CPU tower and printer, and two adjustable shelves for versatile storage options. Finished in Abbey Oak, this space-saving computer desk armoire adds style and function to any room in your home. Storage an issue? Look no further. This armoire from the Carson Forge collection has got you covered. Behind its two doors, it features a garment rod along with a tremendous amount of space for all your clothes and accessories. It also features a lower drawer that opens and closes on smooth metal runners for additional storage! 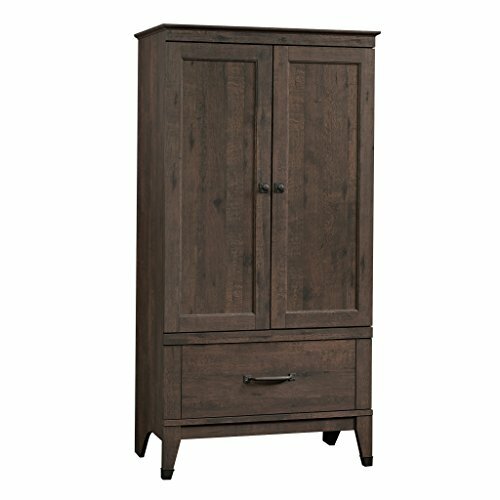 Finished in a classy Coffee Oak and detailed with wrought iron style hardware and accents, this stylish armoire is the perfect solution for you. 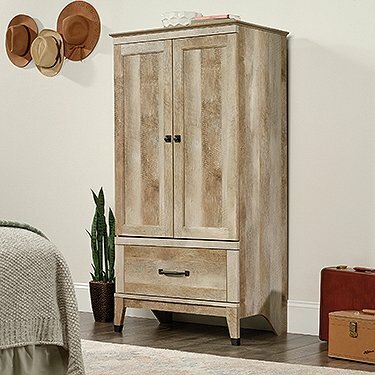 Rethink storage in your home with this country style armoire from the County Line collection. It features two adjustable shelves behind the doors and an easy gliding drawer for storage of books, bins, clothes and more! 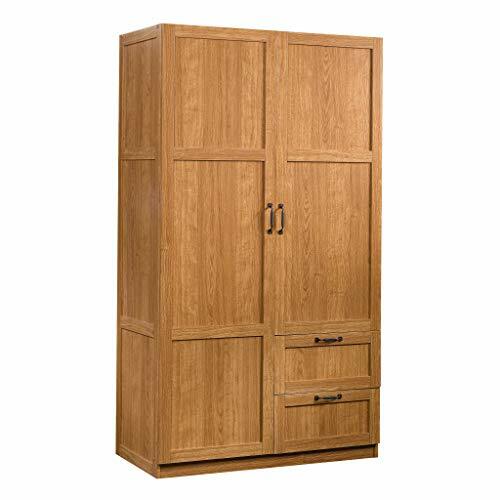 Finished in an eye pleasing Salt Oak, this armoire is the solution to all your storage problems. 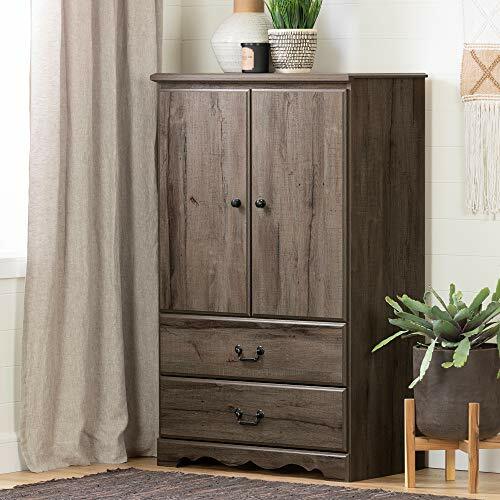 Modern Shape and FinishFor maximum storage space, make this attractive armoire a part of your home… and jazz up your decor! This large, versatile piece of contemporary furniture will work well in any room in your home. And for even more storage space, add some South Shore felt baskets!Generous Storage CapacityDesigned to maximize storage in all the rooms of your home, the robust armoire features 3 adjustable shelves creating 4 storage spaces, with each shelf supporting up to 25lb of bed linen, clothing, toys, books and more. 2 large drawers are ideal for blankets and sweaters, and the furniture is finished with smart metal handles.5-Year Limited WarrantyShop with confidence knowing that we proudly stand behind our products with a full 5-year limited warranty. Assembly is required. Please note tools and accessories are not included. Our products meet or exceed all North American safety standards. Ships in a heavy box, make sure to have a friend with you. Packaging tested and certified to reduce the risk of damage during shipment. We recommend 2 people to assemble. Made in North America with non-toxic laminated particleboard. South Shore Furniture's support team is available 7 days a week if you have any questions. In need of a little extra storage in your home? Look no further! 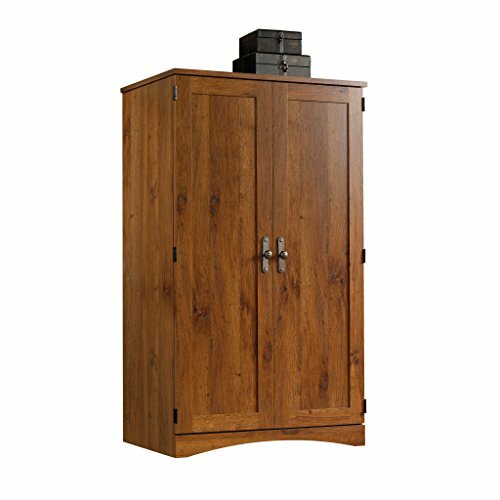 This Armoire from the Carlson forge collection is the solution to all your storage woes. Behind its framed panel Double doors is a hidden storage area that includes a garment rod along with a generous amount of space for you to store anything from dresses and button up shirts to spare blankets and your collection of shoes. It also features a large drawer that opens and closes on smooth metal runner for additional storage of miscellaneous items. Its simple design and charming style Make it a perfect fit for any room in your home – In the bedroom, The entryway or even in the living room. It looks good no matter where it Stands! Finished in Lintel Oak and detailed with wrought iron style hardware, This beautiful Armoire adds style and functionality to your home. Need a place to store your abundance of stuff? Check out this practical and good looking storage cabinet from the Sauder Select collection. It features a garment rod and a fixed shelf behind its full length door, one fixed and one adjustable shelf behind the upper door, and two easy-to-access sliding drawers. Finished in a golden Highland Oak and detailed with frame and panel doors and sides, this piece is perfect storage solution for any room. Looking for a little motivation to get you going on those big projects or paying the bills? A stylish new desk could do the trick. 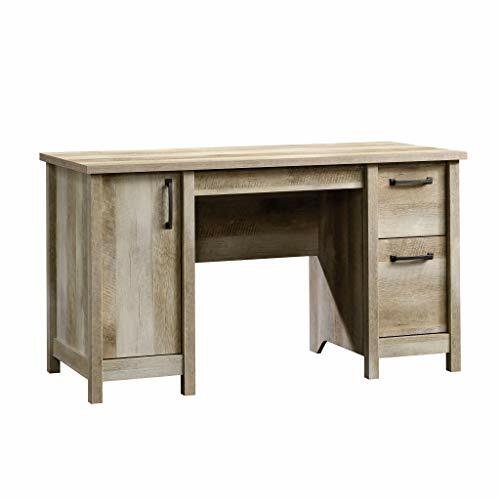 Give your home office or workspace a fresh new look with this rustic-inspired computer desk from the Cannery Bridge collection. Its spacious top surface provides you with room for all your desk essentials like your laptop, stacks of notepads, your collection of pens and even an accent lamp. It features a large pencil drawer that opens and closes on smooth metal runners. It also features two gliding storage drawers for convenient storage of miscellaneous office items. The lower drawer holds letter-size hanging files so you can keep all your important documents organized. Behind the door is a hidden storage area that includes an adjustable shelf and accommodates a vertical CPU tower. It is finished on all sides in Lintel Oak to give this beautiful desk a naturally worn appeal that will stand out in your home. 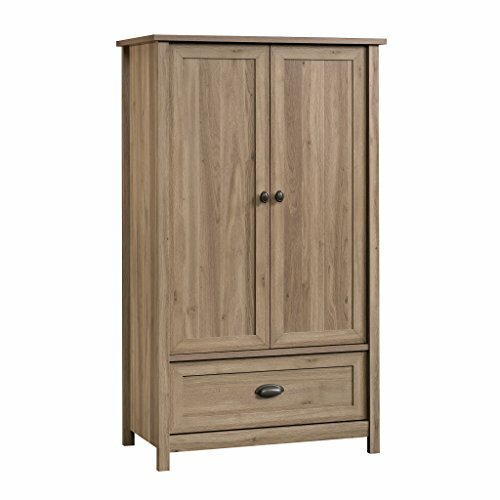 Want more Country Oak Armoire similar ideas? Try to explore these searches: Gray Pearl Necklace, Oriental Green Tea, and Impreza Condenser.